LOGAN, Utah -- Unshaken by a launchfailure of its Falcon 1, Space Exploration Technologies (SpaceX) ispressing forward on a return-to-flight of its privately-built booster. Elon Musk, chairman and chief executive officer of ElSegundo, California-based SpaceX said the maidenliftoff earlier this year and subsequent loss of Falcon 1 has led to ashakeout of the vehicle prior to its next flight. Launch date for the booster's takeoff - carrying two NASAtest hardware payloads - is targeted for November from SpaceX's PacificOcean island launch facility in the Kwajalein Atoll. However, that date could slip into December, Musk told SPACE.comin an exclusive interview at the 20th Annual Conference on Small Satellitesheld here at Utah State University. "November is the plan," Musk said. "Current expectations arethat the launch will occur in November...although if I was a betting man, we'dstart doing our first test firings in November and launch in December." Musk pointed out that SpaceX rocketeers have massivelyupgraded the rocket's health monitoring system - software that verifies thebooster's condition leading up to engine ignition and release. He said heexpected false-positive indications and aborts to occur in shaking out thesystem, leading to the booster launch in December. The next Falcon 1 rocket will carry two NASA test articles:a low-cost Tracking and Data Relay Satellite System transmitter and anautonomous range destruct system package. The Defense Advanced ResearchProjects Agency (DARPA) is the primary launch customer, Musk said, with theNASA payloads chosen by DARPA. In focusing on the March 24 failure of Falcon 1 on its firsttrial flight, Musk recounted the experience. "We initially thought there might have been a [launch] padprocessing error," Musk said. Later investigation of the failure pointed to a smallaluminum nut designed to hold a fuel pipe fitting in place had failed due tostress erosion cracking. That led to a kerosene leak causing the Falcon 1'smain engine to catch fire shortly after liftoff, with the vehicle failingshortly thereafter. Recovered rocket debris helped to sort things out, Musksaid. The rocket landed on an island reef, coming to rest in pieces not farfrom the launch pad in about four feet of water. "Almost no rocket debris was on the island except thesatellite," Musk said. The small experimental spacecraft called FalconSat-2 wascrafted by cadets at the U.S. Air Force Academy. Tossed free of the failedrocket, it slammed through the roof of an unoccupied storage shed on theisland, crashing next to the shipping container used to transport it toKwajalein. Musk said that the booster's premier flight "was about therocket not the satellite." DARPA was reasonably happy, he added, with theoutcome of the flight. "They're not na?ve...they weren't expecting things to goperfectly. They thought that something would go wrong." What DARPA was evaluating, Musk said, is did the rocketdemonstrate responsive launch and did SpaceX obtain a lot of launch data. "And the answer to both of those is yes," Musk added. "As aresult, after first launch, they were actually reasonably happy and boughtlaunch two. They considered the first launch to be a success on those criteriaand I agree with them. We demonstrated a very quick launch and we got a lot ofgood data on the vehicle. It wasn't as successful as we would have liked but onthe criteria that they had for responsive launch demonstration it was asuccess." The Falcon 1's maiden blastoff accomplished 30 seconds ofpowered flight, prior to loss of the launcher. Musk pointed out that the flight did successfully showcasethe launch pad hold down system, the rocket's guidance and navigationequipment, and the booster's engine and thrust vector control, among otheritems. "We have perfect telemetry," Musk continued, "all the waydown to the damn thing hitting the reef." Still, there are other aspects of the rocket that have notseen an in-flight shakeout. "Without doubt, it would have been much better to have atleast gotten to 2nd stage ignition. That would have proven out theseparation...proven out 2nd stage ignition. It would have been nice to havegotten that far," Musk said. Also to fly skyward from the SpaceX Kwajalein launch area isthe company's morepowerful Falcon 9, now under production, with three already sold, Musksaid. The next big event for Falcon 9 is completion of thebooster's large first stage tank, expected to be achieved in the next two tothree months. The tooling to build the launcher is on track as is a thrustframe for handling the rocket's cluster of engines. 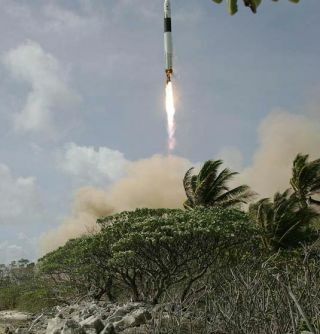 Regarding setting up his rocket facilities on Kwajalein,Musk said, while initially difficult to create a capability there, things havesmoothed out. As for overall cost spent to date on Kwajalein, "I shudderto think," Musk said - noting it's a figure presently somewhere on theorder of $10 million. A roughly equal amount has been spent on preparing aSpaceX launch site at Vandenberg Air Force Base, California. "Kwajalein is working out well...we're pretty well dialed inthere," Musk said. As for the firm's Vandenberg launch site, SpaceX has beenadvised that they can launch from their own site once they have had asuccessful flight from somewhere else. There has been pressureplaced on the company's use of its own pad due to a neighboring Lockheed MartinAtlas 5 launch complex. "Every time they talk to me it gets more valuable...acouple of hundred million dollars every time we talk. The last I heard wasabout $600 million dollars...some crazy number," Musk said. "We can launch from another launch pad at Vandenberg withouthaving a successful launch somewhere else," Musk explained. But doing so wouldentail another round of construction costs, he said, and paying for associatedenvironmental impact studies that are "outrageously difficult." Musk said that his personal investment in SpaceX to date isslightly over a $100 million. "We'll go public at some point and I think the evaluationwill be good...but no rush to go public or anything. We'll probably bring in someexternal funding next year," Musk said, "but we'll see...it may not benecessary." For customers out there launching on SpaceX rockets down theroad, "there should be no doubt whatsoever that we will persevere and we'll bethere to launch their satellite," Musk emphasized. "We're on track to be cashflow positive this year. I think that's pretty good for a company in its fourthyear of operation." At week's end, SpaceX will find out from NASA if they havebeen selected as a player in the CommercialOrbital Transportation Services (COTS) program. NASA plans to spend about$500 million on the COTS over the next five years, with private firms offeringcommercial cargo and crew services to the International Space Station (ISS). COTS isviewed by Musk as one of the highest value-for-money programs that NASA hasever done. "That's my prediction for it...this will be some of the smartest moneythat NASA has ever spent."